Traditionally, Samoa is quite serious about resting on Sunday, and today was no exception. Leaving the Red Cross camp in Lalomanu last night, I asked one of the senior volunteers if she’d was working today, and she told me no one was working today. Well, almost no one. In order to honor the day of rest, extra supplies were distributed yesterday, and Red Cross camps were minimally staffed today. People went back to their villages today to go to church, rest, and reflect—collectively and individually—on the events of the past week. 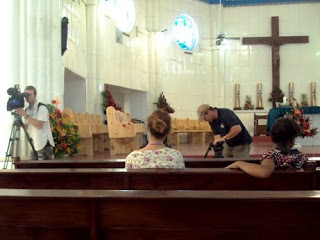 There were Kiwi camera crews at mass this morning, and rightly so: church was where all the action was in Samoa today. 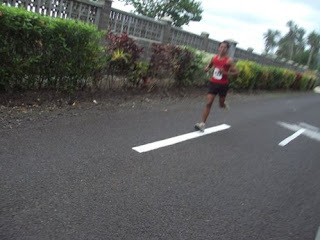 During White Sunday practice, I compared notes with the other coordinators about what I’d seen and where we’d been. Terry spent the week working with the Caritas Organization (Phil: Carnitas? ), a Catholic Relief Outreach group, putting together packages for those affected. “I hear they really need kitchen utensils,” she told me. I didn’t tell her about yesterday’s scotch glasses. The woman sitting next to me at mass wanted to know all about what I’d seen. She speculated the recent apparition of Mary on the John Williams building was a tsunami warning. I shrugged. Walking out after mass, upon hearing I’d worked with the Red Cross, a woman said she’d heard certain villages weren’t getting as much help as others. This made sense to me. 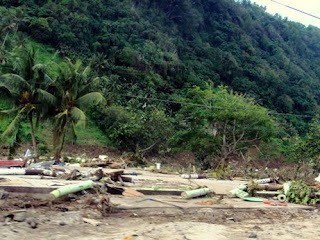 I’ve heard very little about villages along the central part of the south coast receiving much aid. 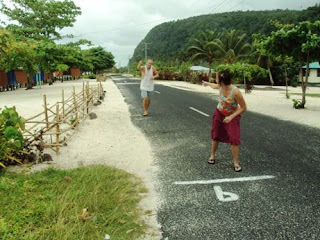 Over to’ona’i this morning, a couple ladies discussed what should be done about the road that runs around the island. 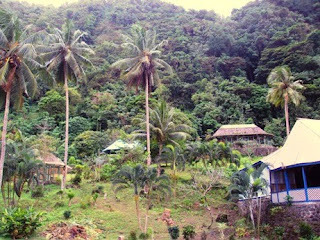 “They should move it inland like they did in some villages during the early 1990s when the last cyclone hit,” said one. There were horror stories like the one of the man who saw the ocean waters recede and went to collect all the fish that were left behind. He died. 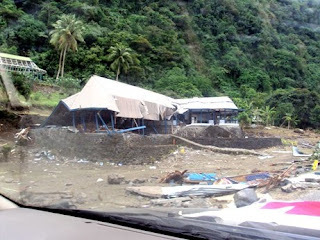 While driving through the badly damaged village of Lepa on the way home last night, someone pointed out it was the Prime Minister’s village. 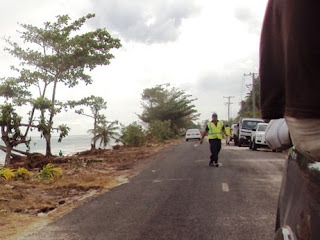 A lady in our truck posited the earthquake and tsunami were part of the curse for the Prime-Minister-led Road Switch that happened earlier this month. The security guard at the Peace Corps office who worked volunteered in Lalomanu during his day off last Thursday told me he was able to switch to the night shift at the hotel so he could volunteer during the day. He’d thought about asking for time off, but “Leai se tupe i fesoasoani.” There’s no money in volunteering. I hope you’re well. Before and After photos below. Before. 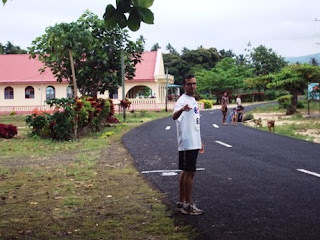 The village of Sapoe on the day of the 64-mile relay. Before. Boomerang Creek cliff fales. After. The fales themselves survived. The main building did not. Before. 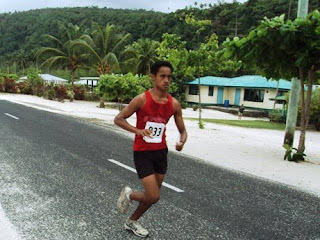 My year 12 student, Pene, running along a wall somewhere between Saleapaga and Lalomanu. Before. Tanu Beach Fales in Lalomanu. After. If you look closely, you can see the "9" spray-painted on the street. Before. 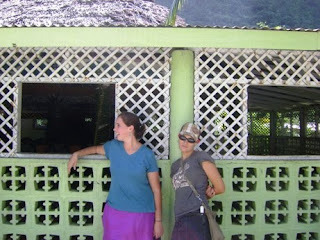 Blakey and Kate standing in front of Faofao Beach Fales main building. Before. The house in the background here is now the rubble we searched through on Wednesday. 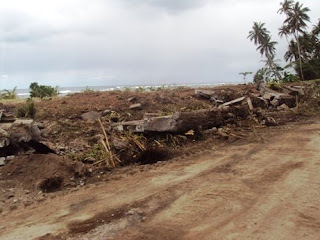 It is one thing to read your blog about what has been happening in the villages while you help with the red cross but the before and after pictures really tell the story. Stay safe. The before/after pictures are so sad. I really appreciate popping in and seeing what has been happening. 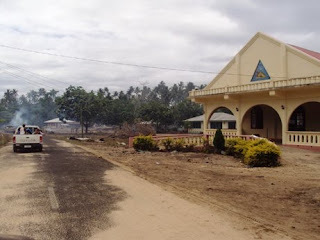 i totally guessed that there would be correlations between the virgin Mary's appearance and the Tsunami...i missed that there would be a connection with the road switch...how classically Samoan! Great coverage Matt. I feel the weight of this experience.